I took these pictures many months ago and even though I had been thinking of writing about them for a while now, I felt uninspired. A week ago, when my friend Diane Fergurson asked me if I would write an article for the Mind, Body and Spirit blog, suddenly it clicked. 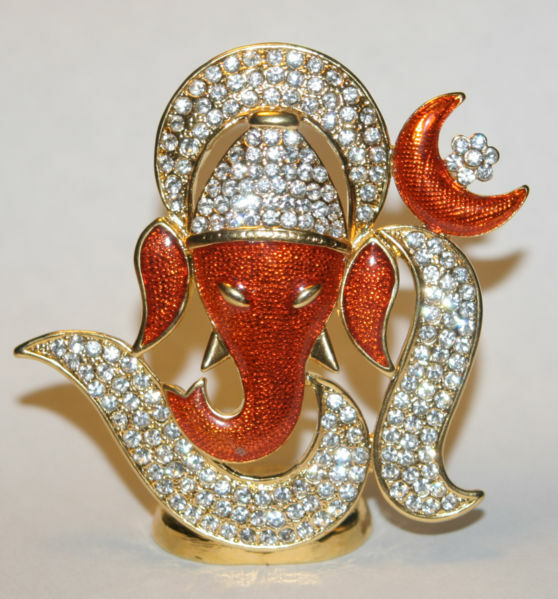 May be because tomorrow is Ganesh Chaturthi, the festival of Ganesha's birthday. Ganesha is one of the most adored in the Hindu pantheon of gods and Ganesh chaturthi is grandly celebrated by the natives of Indian states of Maharashtra, Tamilnadu, Karnataka and Andhra Pradesh. In the US, Ganesha is a familiar figure to those who practice yoga. Yet the image of Ganesha with his elephant head and a potbellied human body has fired up the imagination of Hindu artists and has become anything and everything they want him to be. In their hands he could be a busy businessman cooking up deals on the phone or an elderly gentleman taking an afternoon nap or a percussionist in a band or a a stylish beau out on stroll swirling his walking stick or a yoda-like figure or a joyous dancer. 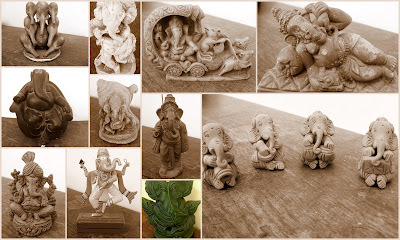 This trend started about twenty years ago when it became a hobby for many to collect these cute and charming images of Ganesha. These images are usually made in clay but sometimes they are also made in precious gemstones for the rich collectors. My sister is a collector too and the collage above shows a few a from her collection. It is always fun to stand in front of the curio cabinet and look at her collection of ganeshas because they bring a smile to your face and joy to your heart. Thank you to Indira Govindan for writing this wonderful blog post for us and sharing her fabulous pictures! You can stop by her shop, "DharmaKarmaArts", on Etsy! "Mudras: Gestures of a Different Kind"